Car, Motorcycle, Spare Part, Workshop, Car Wash etc. Tebet Barat Car, Motorcycle, Spare Part, Workshop, Car Wash etc. Ketik METRO <spasi> PLAT NOMOR kirim ke 1717. 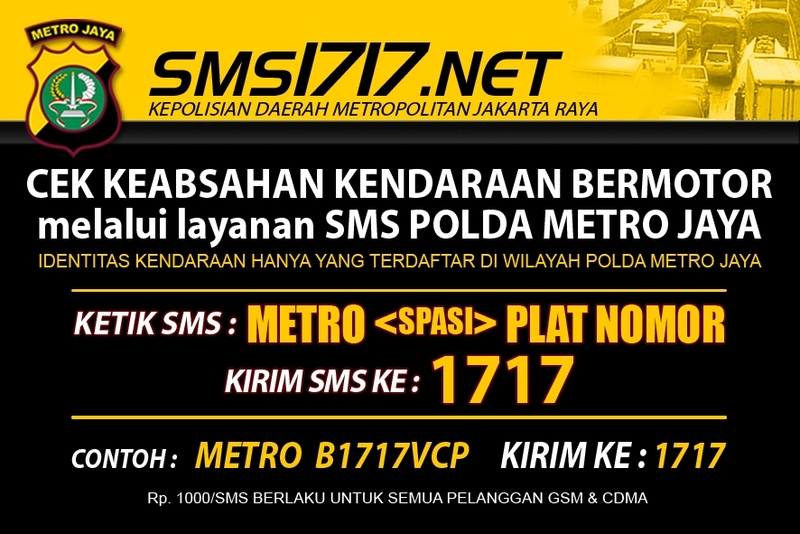 Contoh METRO <spasi> B1718AB kirim ke 1717. Click GAMBAR to see the banner. DAIHATSU Inovation For Tomorrow Daihatsu Tebet Jl. Prof. Dr. Supomo SH. No. 31, Jakarta Selatan 12810 Telp. (021) 8301088, 8296036 Fax. 8295743, Contact us, Website daihatsu. Sales, Services, and Spare Parts. HONDA The Power of Dream, Honda Tebet Jl. Prof Dr. Soepomo No. 44 Tebet Barat, Telp. 8281393-94, 8312802-03, Fax 8281395, Email contact, Website honda. Sales, Services, and Spare Parts. TOYOTA Moving Forward, AUTO 2000 Tebet Supomo, Jl. Prof.Dr.Supomo SH 46, Telp. 8302000 (Hunting), Fax. 8300432, Email we care, Contact us, Website toyota. Sales, Services, and Spare Parts. TOYOTA Moving Forward, AUTO 2000 Tebet Saharjo, Jl. Dr. Saharjo No. 146 A, Telp. 83705870, Fax. (021) 83705875, Email we care, Contact us, Website toyota. Sales, Services, and Spare Parts. ISUZU Rajanya Diesel, Pakai Panther Pinter, Jl. Warung Buncit Raya 9, Tel. 7944450, Fax 7983524, Contact us, Website isuzu. Sales, Services, and Spare Parts. BMW Built your dream car TEBET Jl. Dr Soepomo No.174 Tebet - Jakarta - 12810 Ph. +62 21 8301805-7, 8298451 Fax. +62 21 8305704, Contact us, Website bmw. Showroom, Workshop, and Spareparts. Bengkel FAST Jl. MT. Haryono Kav. 1 Pancoran, Tebet, Samping Superindo Patung Pancoran, Tel 8303027, Fax 83700767. Service Mobil, Balancing, Spooring, Nitrogen, Ban Mobil, Baterai, Acessories Mobil etc. Sabtu dan Minggu Buka. BIBIL Snow Car Wash & Salon, Hydraulic System, Jl. Tebet Barat 1 No. 5, Tel. 8295228. Car Wash, Body Polish, Per Panel, Glass Polish, Machine Chamber, Interior, Bongkar BKU etc.